How many attacks can be focused on one point? What is the maximum (realistic) amount of attacks that are focused on a single point on the board? Not sure what you mean by "realistic". Basically you can attack it with 8 knights plus 7 other pieces attacking horizontally/vertically/diagonally, i.e. from each cardinal direction (North, NorthEast, East,...) except for one. At the start of the game each player has 16 pieces of which two are bishops of opposite color. That's why one of the bishops will not be able to attack the square and the maximum number is 15. In the example 7 of the knights are fixed. You can think of (1) using other pieces to attack along the cardinal directions or (2) replace one knight with a piece attacking from f4. You can move pieces that attack along the cardinal directions further away from the attacked square but this does not help to focus more pieces on the square unless you count batteries double. In any case you are running out of pieces to achieve more than 15 attacks. It is possible to get 8 knights and two dark squared bishops through pawn promotion. In the example 6 pawns have been promoted to knights and one pawn to a bishop which together with the remaining pawn sums to 8 pawns. Not the answer you're looking for? Browse other questions tagged attack or ask your own question. 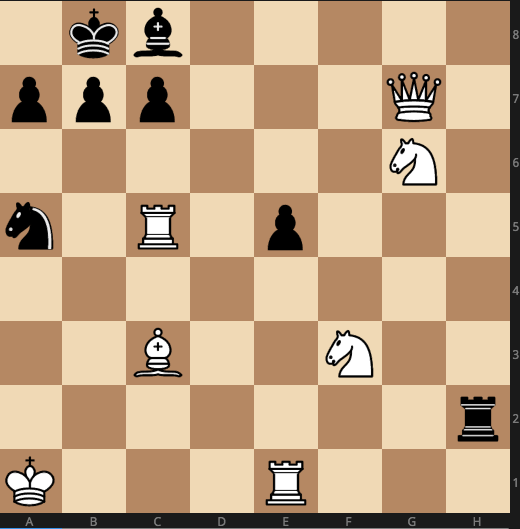 How would you analyze this critical position from my most recent game?